With all the attitude that Deadpool shows when he's fighting people on screen we have to wonder what he's like in his downtime. Is all that sarcasm a front for a sensitive soul? Or maybe that's what he's like all the time, he might even have a secret stand-up routine. With what he's been through he's got plenty of material! What would you do in that suit if you had the chance and all of Deadpool's skills? Everyday activities would definitely be more interesting. It would be nice to be able to go through the airport without picking up some annoying kind of flu while utilizing his immunity abilities. With his quick as lightning reflexes, you could take up laser tag without ever losing, with your quick reflexes you'd be sure to annoy any groups of middle school boys who were trying to take you down. We also think that pulling off some sweet parkour moves when simply walking down the street would be a lot of fun. Sure, your friends might be a little annoyed when you leave their side and end up balancing on top of a wall but imagine the Snapchat opportunities! They'd thank you in the end. This sweet suit tells the world that you've got some special skills, even if those skills are limited to reciting all of the hilarious one-liners. You'll have a great time in the flexible suit, it's easy to put on with a zipper at the back. 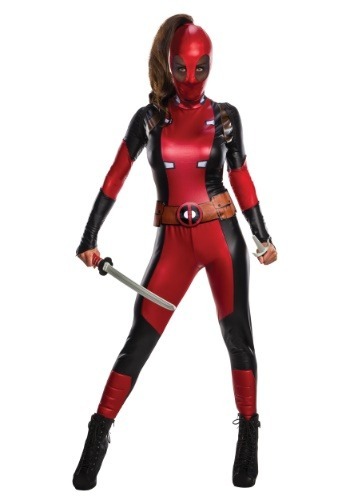 The costume also comes with a hooded mask and soft, comfortable belt. You might not be fighting villains but you're sure going to kill it at your costumed events this year! Just a warning, this costume does not come with limb regeneration abilities!